Can a State prohibit the publication of false news? And if it couldn’t under normal circumstances, should it be allowed to do so under exigent circumstances, such as a state of emergency? This question is now before the European Court of Human Rights in the case of Dareskizb v. Armenia. 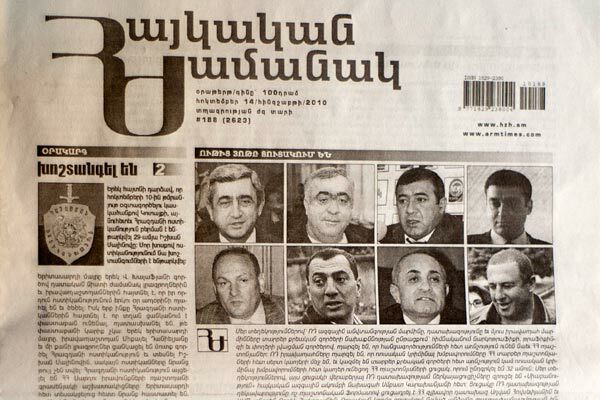 The facts of the case (set out in the Statement of Facts and Questions to the Parties) concern the aftermath of the 2008 presidential elections in Armenia, when people took to the streets in protest of the election results and clashed with police. According to the facts submitted to the Court, these clashes resulted in ten deaths, dozens of injuries and the damaging of a considerable amount of property. A state of emergency was then declared by Presidential Decree. This decree contained a provision banning the publication of “false or destabilising information”, following which the daily newspaper Haykakan Zhamanak, published by Dareskizb, was prohibited from printing several of its editions. One of the questions before the Court is whether Dareskizb’s Article 10 rights have been violated. Many national supreme courts have already held that false news provisions are incompatible with the right to freedom of expression, but it appears that this will be the first time the Court might take a position on the compatibility of false news laws with Article 10. It is important to note in this context that the prohibition of false news is not unique to Armenia. A significant number of countries including Egypt, Sudan, Cameroon, Syria, Bahrain, Burma and Malaysia have “false news” laws on their books. Often these laws are used to oppress political opposition and silence human rights defenders. The Court’s findings in this case could therefore send a signal that has much wider implications than for Armenia alone. “does not prohibit discussion or dissemination of information received even if it is strongly suspected that this information might not be truthful” . In other words: the right to freedom of expression is not limited to merely truthful information. This also ties into a practical aspect, because who will decide whether the message in question is intended to represent opinion or fact? Better yet: who gets to determine what is “true” and what is not? The need to make this determination between truth and falsity is clearly open to State abuse. Moreover, the risk that statements might be awarded described as “false” is likely to have a substantial chilling effect. Journalists may hold off from publishing certain stories when the veracity of a news report could not easily be proved in court (or if proof would be impossible to provide even if it were available, due to the need to protect sources, for example). Such fear of prosecution would result in a considerable set of information not reaching the public at large. While it may seem tempting to argue that the dissemination of false news could pose a threat to public order, especially during a state of emergency, it should be kept in mind that limiting news output to only “true” or State-sanctioned news actually poses a threat to democracy itself. In particular during elections it is important to prevent those holding office from controlling what news reaches the public and what doesn’t. In a truly democratic society, the way for a State to respond to any false news coming into circulation would be to counter it with correct information, not to clamp down on the press publishing the allegedly false news. Access to the media should be a sufficient tool for State agencies to diffuse false messages; shutting down outlets that do not propagate State-sanctioned news is unnecessary and disproportionate, no matter what the circumstances. In this context, the situation in Armenia at the time illustrates the risks of allowing State institutions to control the news. Human rights reports on Armenia in 2008, such as that of the US Department of State, paint a grim picture of a government committing increasing human rights violations, particularly during the elections, and State authorities using harassment and “intrusive application of bureaucratic measures to intimidate and retaliate against government opponents.” An important factor in this were the restrictions imposed on freedom of the press during the state of emergency, with special note made of the continuing practice of self-censorship by journalists. If limiting the news to State-sanctioned messages is a threat to democracy itself, this holds even more true during times of elections, when a nation’s citizens should be able to inform themselves on the widest possible range of information and opinions. Given that the risks of maintaining false news laws far outweigh the risks posed by any false news coming into circulation, it is important that the Court’s findings provide adequate safeguards against their inherent potential for abuse. From this perspective, the most straightforward approach would be to establish that false news laws as such are incompatible with Article 10, state of emergency or not. (1) False news provisions have been rejected by all true democracies as being contrary to the essential requirements of free speech, as inoperable and as open to State abuse. (2) The existence of a state of emergency cannot justify false news provisions, which are unlikely to be of any material efficacy in preventing public disorder and/or are more likely to be used by the authorities to repress dissent, particularly at times of elections. Provisions governing incitement to violence should be sufficient to deal with any true public order issues. (3) The Court of Human Rights should, in accordance with the approach adopted by national supreme courts in Canada, Uganda, Zimbabwe, USA, Antigua and Barbuda (Privy Council) and the UN Human Rights Committee hold that false news provisions are incompatible with Article 10 and, further, that no derogation from the Convention can render them lawful.